More TV Memories – Football League Extra. In 1996, a got a video recorder for Christmas. Before this, I had to use the one in the front room if I ever wanted to record anything, but now I had one in my bedroom I decided to set the timer for all kinds of odd late night things to discover what they were like, and Football League Extra was one of those programmes. 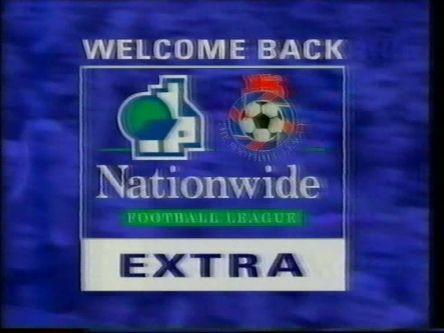 Live football coverage has long since gone to Sky, and highlights of Premier League matches now appear on Match Of The Day, while throughout the 90s highlights of the second, third and fourth tier matches (which were sponsored by Nationwide in the mid-90s) were shown on ITV. 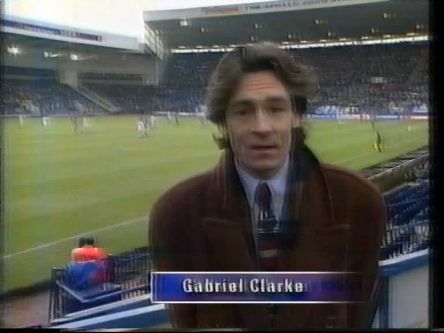 Football League Extra at this point was hosted by Gabriel Clarke from a different ground every week, for example in the edition that I am reviewing he was at West Bromwich Albion’s ground The Hawthorns, and the theme music was “Little Britain” by Dreadzone. As I have said before, although I have never been good at playing sport myself, I have watched plenty of sport coverage over the years, and I particularly wanted to record a specific edition of Football League Extra when I heard about a remarkable incident which featured in one of the matches in January 1997. 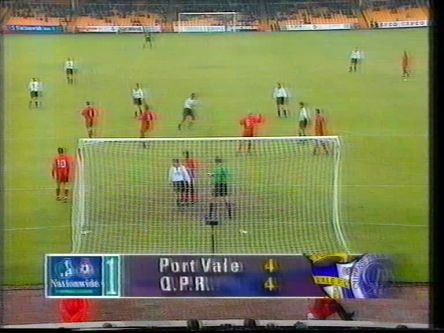 There was a match in the second tier between Port Vale and QPR, were Port Vale were leading 4-1 with five minutes to go, but QPR ended up with a 4-4 draw! Well the commentators Peter Brackley and Jimmy Greaves couldn’t believe it! 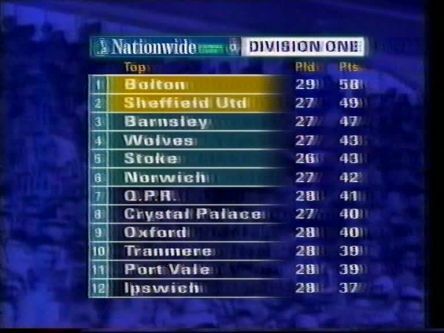 I believe that the 1996-97 season was the last time in most regions that a second tier match was shown live on Sundays. I also remember Peter Brackley commentating on Channel 4’s Football Italia at the time too. Football League Extra also featured various interviews with people in football and the latest news, and there was also a nostalgic feature, where highlights of a classic game from the archive were shown. The match in this edition was from April 1990 where Liverpool beat Chelsea (sponsored by Commodore in those days retro computer fans) which would send them on their way to their 18th (and currently final) league title. One thing that is interesting looking back at this show now is how much the fortunes of some clubs have changed over the years, with some clubs who were lower down the league at the time now in the Premier League, and some clubs higher up the league now being much lower down, or even out of the league altogether. 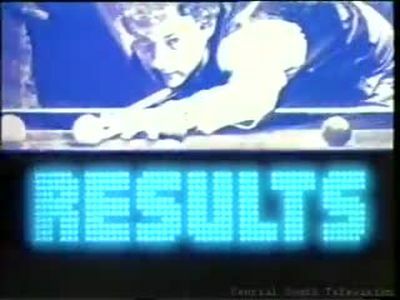 The end of the programme featured the league tables and some statistics about what had happened in the weekend’s matches. One of the reasons that Football League Extra came back into my mind recently was because after a few years on the BBC, Football League highlights for the first time this season are on Channel 5, and there has been much debate about their presentation of the coverage since the start of the season. ITV’s Football League Extra was about 45 minutes long (half the length of the current Channel 5 show) and was usually shown on Mondays around 1am (the current show is in a much more prominent Saturday at 9pm slot). There have also been complaints about Channel 5’s coverage coming across as gimmicky, ITV’s show was certainly not in front of a studio audience for example. It really goes to show you how much TV coverage of sport and sport itself has changed over the years. The YouTube Files – Grandstand. In one of my previous pieces on here I reviewed ITV Sport’s Results Service, the show on Saturday afternoon where they featured the football results. 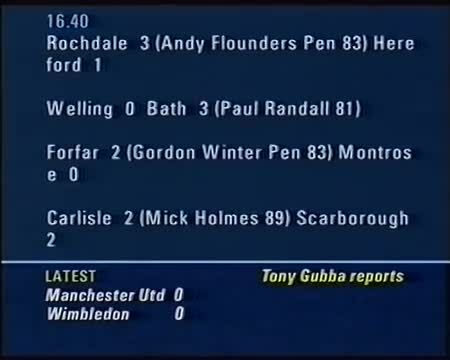 Now it’s time to review the BBC’s equivalent Final Score which was shown as part of Grandstand for many years. The example I’m using was shown on 21 March 1992 and uploaded to YouTube by “BiroWyb2” so credit goes to them. Saturdays always seemed to be exciting on BBC1 when I was younger. After the CBBC Saturday Morning show ended after over three hours, you’d then get about five hours of the latest exciting sport action in Grandstand, followed by lots of great primetime entertainment shows. 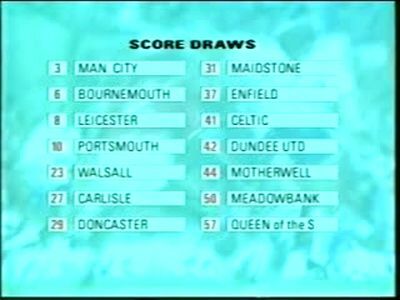 Grandstand ended with the segment Final Score, which featured the day’s football results. It was usually hosted in the 80s and 90s by Desmond Lynam, Bob Wilson, or, as in the example I’m using, Steve Rider, and all of them handled this fast-moving segment of the show well. A lot of people used to watch to discover the fate of their team and their rivals for that week. 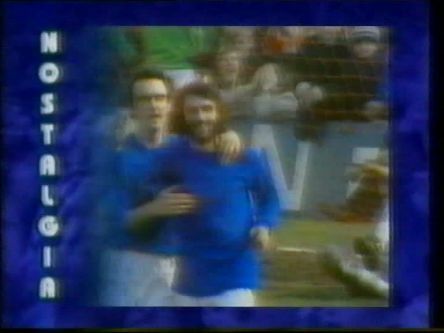 One of the most memorable things about the vidiprinter was when a team scored seven or more goals in a game the number was also spelled out. As far as I know, the highest ever score to appear was a Scottish Cup match in December 1984 that finished Stirling Albion 20 (TWENTY) Selkirk 0. Once enough results had come in it would be time for the classified check. Cue every other comedian having a “why are the results classified if they’re public knowledge?” routine. They would be read out by Len Martin or Tim Gudgin and they could both do that thing where you would know what the result would be just from the tone of their voice. Then it’s time for a look at the league tables. What with this being near the end of the final season before the Premier League came along in England, there aren’t many games left to play. Will Leeds become the champions? It’s possible. Also featuring in the relegation zone are Luton and Notts County, who did go down, and they haven’t been back in the top flight since. There would also be a look at the pools news, so get your coupons ready to discover those all-important score draws. 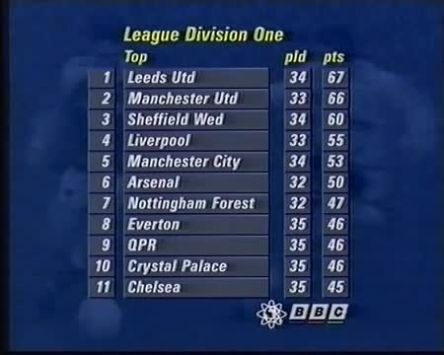 The results carried on being reported like this until the end of the 2000-2001 season, at which point Final Score became a programme in its own right and the technology was modernised. 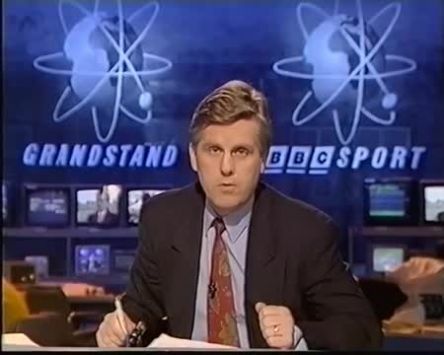 After Grandstand ended in 2007, the show continued and can now be watched for the whole afternoon on the red button. The YouTube Files – ITV Results Service. I was never any good at sport, it’s just one of those things that I can’t do. However over the years I have watched a lot of sport on TV so here are my memories of a particular programme that I remember watching. 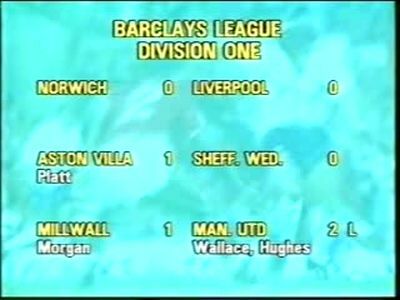 On Saturday afternoons many years ago, before Sky Sports and the Red Button, if you wanted to find out the football results you had to wait until a short programme on ITV at 4.45. Although I’ve never particularly followed any clubs I do remember watching this so I went on YouTube to see if there are any episodes on there. I was pleased to discover that there are a few so for my review I have selected the edition shown on 10 February 1990 which was uploaded by “CentralSouth5” so credit goes to them. Of course the BBC had their own version of this show featuring the Grandstand vidiprinter which I also remember and will be reviewing in a future edition. 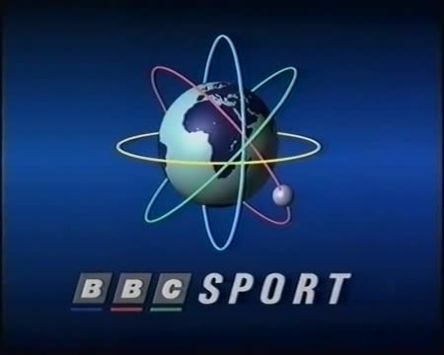 After ITV’s World Of Sport ended in 1985, the football results continued as an individual programme until 1992 when the Premier League launched. 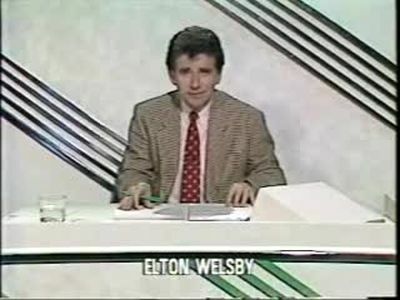 It was hosted by Elton Welsby who was ITV’s main football presenter at the time, he was essentially the Adrian Chiles of his day. It begins with the ITV Sport symbol introduced in 1989 and then we get the title sequence which isn’t computer-generated so it looks old-fashioned even by 1990 standards, but it is accompanied by some funky music. Also featured in the titles are other sports including horse racing, but I’m fairly sure that the show only ever covered football results. So let’s find out what’s currently happening in Division One as the results come in. 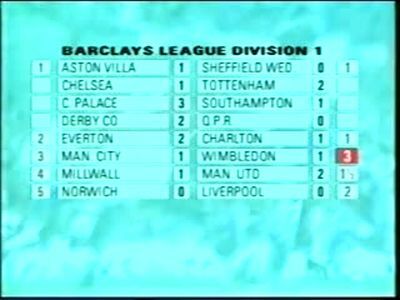 We are shown some of the latest scores, look, Gary Lineker’s scored his 19th goal of the season. Then we are shown some highlights from a match. I’m fairly sure that ITV didn’t have an evening Match Of The Day-type programme so this would be the most that would be shown of the matches on Saturday. 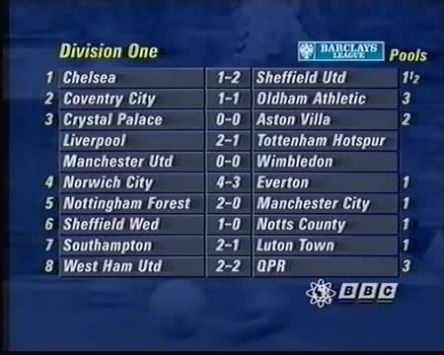 ITV also showed live coverage of Division One games on Sundays. After some more reports, we get the results. It’s interesting to look back at this era of football knowing what we know now, for example seeing clubs such as Millwall and Wimbledon in Division One who are long gone from the top flight, and clubs in Division Four such as Scarborough and Maidstone who have long since disappeared from the league altogether. Then we get the Pools results! This was before the Lotto, and the only way you could really win big at the time so get your coupons ready. They are still going but no-one is really bothered any more. Then we get the Division One table but only the top six and bottom six and Elton tries to make sense of it all. The other tables aren’t even shown. Finally we get some more reports this time featuring a few pictures of goalscorers before being reminded to watch the League Cup semi-final first leg on ITV tomorrow. 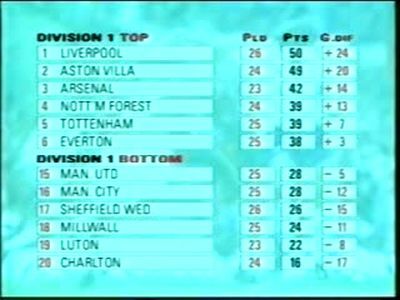 This video was a great reminder of those days before Super Sundays and Massive Mondays when this was the best way on TV to find out the results.